Well I’ve started the process to work towards having mobile HF (and VHF/UHF) in my daily driver. The current daily driver is a 2008 Chevrolet Suburban LTZ – the one with the very cool engine that is a V8 when needed and settles back to a V4 when conditions allow. This is my fourth Suburban, and complicating doing mobile HF is my usual driving pattern of 25,000-30,000 miles a year, and that I change the vehicle usually about every 2-2-1/2 years. This means that any install will be yanked out and moved to the next vehicle 24 to 30 months after installation. Also complicating my mobile efforts is my need to use all the space in the truck – we have a large family & travel together when used privately, and I often have equipment or materials in the truck when driving for work. I also ferry my instruments when playing with various bands. So the Radio Gear has to tuck away very well and not interfere. Spending a good 1/4 of my time driving on the phone, using a Motorola T505 Bluetooth device providing a full hands-free setup. The vehicle is also heavy on electronics – XM radio, GPS Navigation, Computerized Brakes/Stability/Traction (this system has saved my bacon several times over the years when people pulled out in front of me – HIGHLY recommend this option) and active safety gear. The RF from the radios simply cannot interfere with the basic vehicle. So I am examining my options. I did acquire a new IC-7000 a good friend had bought but ever used. I want to pick an antenna that color matches, and can be re-painted to match the next truck. I also want to put the gear into a modular set-up that will come back out easy when it is time to move it to the next truck. Very open to suggestions on how other people have solved this sort of problem. Rather think everyone’s attention has been focused on National & World events. Don’t know about your personal experience, but watching my 401K drop in value enough to the tune of a couple year’s salary completely gone hasn’t been a lot of fun. Last night we were told a lot of promises – all the things that are going to be fixed and all the money that is going to be spent to do it. Does all this have an effect on Amateur Radio? Perhaps not directly, but almost certainly it does. I’m hearing people talking about skipping their annual Dayton pilgrimage due to personal economic concerns. I’m hearing people asking around if there is any interest in buying their spare, unused and old gear as they make efforts to clear the excess in their lives and gather up cash. I hear of Trusts that have given Grants for Amateur Radio in the past putting ALL grants on hold, and reducing scholarship awards in some cases. I hear of the price advantage in downward renegotiation of purchase prices for bigger ticket items like towers which had peaked in 2008, but appear to be in ready & less costly supply today. I hear of more trading back and forth of gear, rather than buying new gear. I see $200 discount coupons for $1000 radios, all sorts of special offers, free shipping & accessory allowances for those still willing to buy new gear. No it doesn’t look like Amateur Radio is going to get any direct stimulus, but the on-going costs of the hobby sure look attractive in such a down market. I can see many of us spending some quality time on the air. And of course the emergency backup and lack of censorship may be handy. 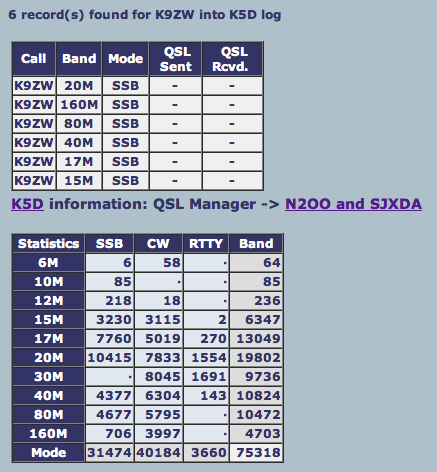 Looks like just Six Band/Mode contacts for my station to Desecheo K5D. Unless there is a significant propagation change 12m, 10m and 6m are not going to happen from 9-land to KP5-land. Perhaps some of the modes I’ve not yet QSOed with K5D might get filled in if I get time and IF they are on. Had decided to work K5D on SSB phone as a first concentration. Very pleased how my simple station and specially the Flex-5000A have worked for this easy Caribbean-Wisconsin shot. Made six attempts, usually with now more than 3 or 4 calls in the pileup (I try to “play well” with others calling). I’ll keep listening for the 12m, 10m and 6m window, but those may be tough. Expect I’ll set up my rig to run RTTY and see if I can fill in those K5D contacts this weekend. Interesting how it is in the wee hours that it is a solid 59 for K5D into Wisconsin. The 3 AM to 5 AM local time (Central) time slot may be antisocial but the radio does work. Guess it is worth getting up early for something! Amazing how other tasks in life get in the way of solid chunks of operating time. Did squeak in a few K5D Desecheo Island contacts, with 160m SSB being the best prize so far. Used the Flex-Radio Flex-5000A. Did take the time to update the Flex-5000A to the latest Firmware and the PowerSDR software front end to its latest full release. Very quick updates, the only minor annoyance being that version 1.16 upwards of PowerSDR has a new settings database, meaning an operator has a lot of settings to recapture manually. Week seems full of various musical rehearsals (Bass Sax & Bari Sax), family functions (several Birthdays), a bit of snow to clear and lots of work, as in job work. Did arrange to have some special high-strength masts shipped to George W9EVT on WI-001L Washington Island. Trucker says they went to the ferry dock, but of course they have to be “found” now. Hope to fill in the bands with more K5D QSOs and maybe – just maybe – brave the ARRL International DX CW event this weekend. Really don’t know why even after some effort I always feel like I have forgotten every bit of CW and feel the rank beginner each time. Must just be me.